Outstanding Dreams Farm is a Maryland Alpaca Farm nestled on 15 acres of scenic Chesapeake countryside. We provide high quality alpaca sales and alpaca breeding services and are passionate about sharing our love and knowledge of alpacas with visitors to the farm. Our business also features the Outstanding Dreams Farm Store, which offers a variety of products crafted from luxurious alpaca fiber. Like many of you, we were searching for a business venture we could operate together from our home. Our “Outstanding Dream” was to find an enterprise we could enjoy together that was both profitable and low risk. Phil is an avid animal lover while Vicki enjoys a variety of crafts and sharing her skills with others. We began our search for a family business online, researching and reading. Phil was intrigued by alpacas – and everything he read just reinforced his interest! 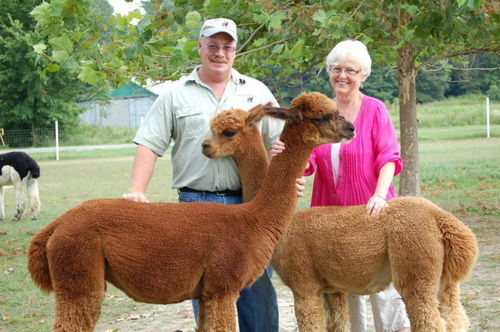 Vickie was hesitant at first, but was convinced to visit an alpaca farm to learn more. Once we met the gentle alpacas we were both excited – but needed to make sure the business side of an alpaca farm would actually be profitable – we weren’t interested in a hobby farm. We were both excited to learn that Alpacas can be highly profitable as a business, with several income sources! We were convinced – and Outstanding Dreams Farm was born! There are two breeds of Alpacas, Huacaya and Suri. We chose to raise Huacaya simply because they appealed to us more than the Suri. Someday, we may decide to raise some Suris, but right now we are concentrating our efforts on raising Huacayas. They are adorable! Our herd is growing – and we attend frequent shows and workshops to ensure we are breeding up, making each generation better! We have a variety of colors ranging from Beige to Black, and one Pinto, who is our favorite. Her name is Anticipation Annie, she is our first cria (offspring) born on the farm. Annie is truly one Special Alpaca. Alpacas come in over twenty natural colors! We invite you to visit Outstanding Dreams Farm! Meet our animals, learn about the benefits of alpaca farming (did I mention tax credits and insurability yet?) and browse through our store. We currently sell yarn, rovings, raw fleece, as well as finished garments & stuffed animals, blankets, gloves, etc. We are carry excellent quality alpaca products made in America from our fellow U.S. alpaca farmers in our Farm Store. 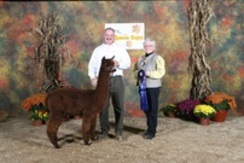 We sell our quality-bred Alpacas for both quality fiber production and breeding stock. We offer On Farm, Interest-Free Financing on your purchase of breeding stock alpacas.We also offer Package Deals on purchases of two or more alpacas. 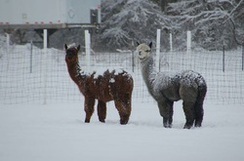 We’ll even board and care for YOUR Alpaca on our Farm! In addition – we’ll help you set up your OWN Alpaca farm, if that’s your dream! Our focus is on providing you with quality alpacas at a reasonable price, while being there for you with personalized customer service after the sale.Our goal is to build our reputation one satisfied customer at a time! For the past 3 years,we both have served on The Show Committee for the Maryland Alpaca Breeders Association while Phil currently serves as President on The Board of Directors. Welcome to Outstanding Dreams Farm – where dreams really do come true!